Rahibai Popere, an adivasi farmer of Ahmednagar district. 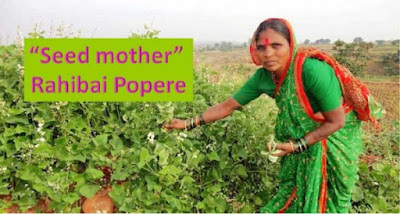 Rahibai Popere, 54-year-old mother and never went to a school but learnt the importance of native crop in a hard way. She is a self-made expert in the field of agro-biodiversity, landrace conservation and several other innovative techniques in paddy crops cultivation. She hails from Kombhalne Village of Ahmednagar district of Maharashtra. She is known for her work on conserving and multiplying 48 indigenous landraces of 17 different corps including, hyacinth bean, paddy, pulses, oilseeds and millets! Rahibai who grew up in a simple village background explains in confidence about her work. She offers training to students and farmers regarding seed selection, soil fertility, pest management and control. In addition, she supplies seedlings of native crops. She urges farmers to grow local varieties rather than hybrid varieties. She managed resisting hybrid seeds for two decades. Due to this remarkable achievement, she has emerged as an ambassador for organic farming in her State and beyond as she has observed that traditional varieties are better able to cope with pests and the vagaries of weather. With the increase in global health consciousness, organic food is set to knock every door and make its way in healthy kitchens worldwide. 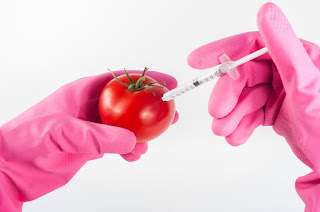 People the world over use organic food as a hygiene factor rather than a product by itself. 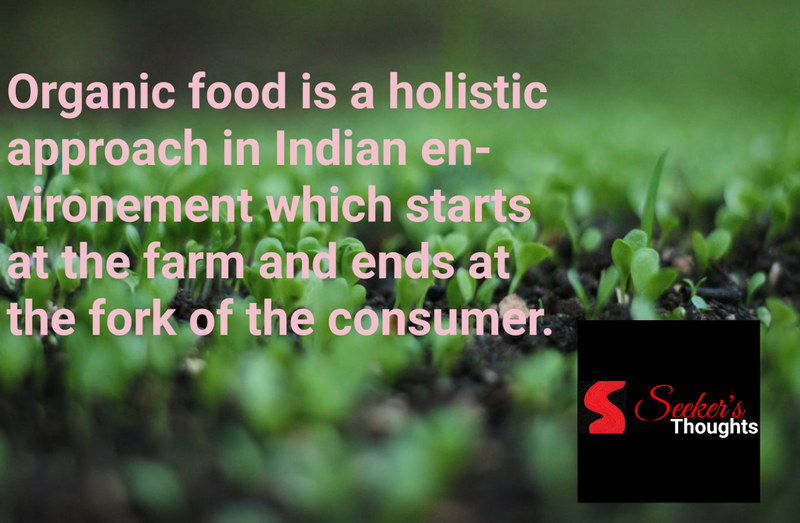 Organic food is a holistic approach in the Indian environment which starts at the farm and ends at the fork of the consumer. The main stakeholder is the source, and challenges faced during organic farming can be overcome with a smart strategy, scientific planning, responsible public activity and government support. Today, the wheel has come full circle, with organic farming finding its way into policy. This is because the introduction of hybrids on a large scale has led to increased dependency on fertiliser, pesticides and water, contaminating the food chain. The Perception- Organic is better than conventional food business. According to a study by ICRIER, a number of companies and start-ups have entered the scene since 2006. 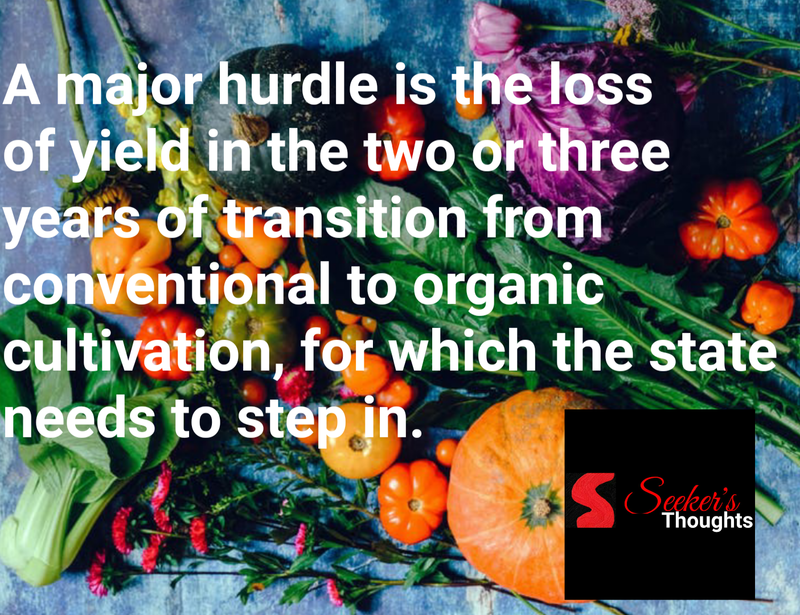 They perceive better returns in the organic than conventional food business. 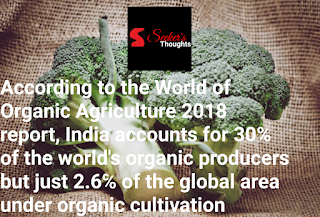 India’s export of organic products has been rising at above 15 percent in volume terms in recent years and is expected to touch 20 percent in the next five years, given the global shift in dietary preferences. 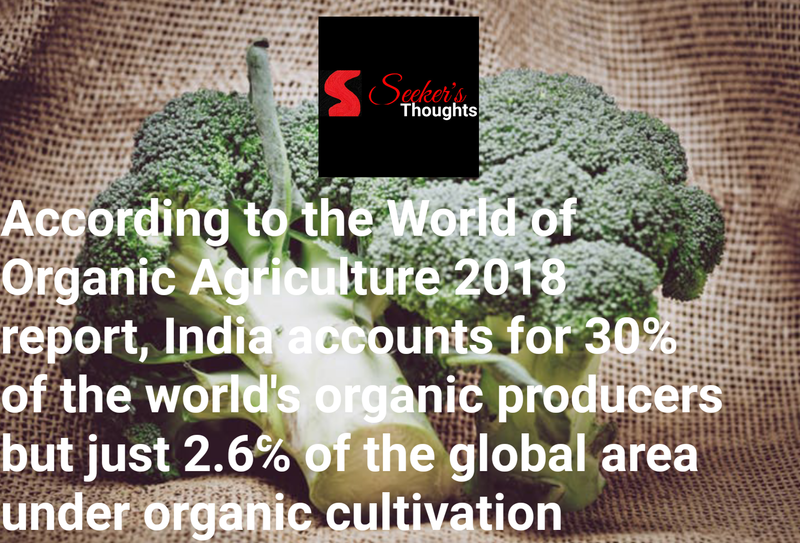 According to the World of Organic Agriculture 2018 report, India accounts for 30 per cent of the world’s organic producers but just 2.6 per cent of the global area under organic cultivation, which is about 58 million hectares. There are regulatory and logistical challenges that need to be overcome. 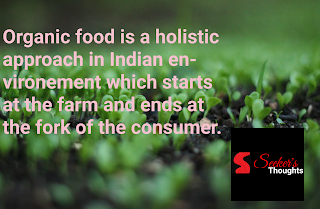 Organic farming, as a whole, is quite an expensive process that involves constant expenditure. This keeps it away from the reaches of a nominalised farmer on the grounds of affordability. 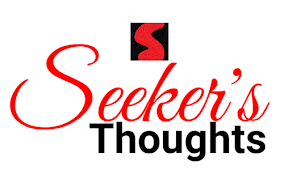 One can easily bring up the instance of fertilisers and maintenance. Sewage sludge and chemical fertilisers might not be something one envisions in his produce, but conventional farmers find constant companions, owing to their cost-friendliness. A major hurdle is the loss of yield in the two or three years of transition from conventional to organic cultivation, for which the State needs to step in. A certification system that meets global standards without being expensive or cumbersome is called for. At present, a multiplicity of agencies and authorities are involved in this process. Despite the growth of Farmer Producer Organisations and other groups to pool in marketing and input resources, processing cost can be brought down. Karnataka, with its arid tracts, has promoted organic farming through FPOs, with many of them growing millets and value-added products. Generally, the demand comes from the big metros, and these are exactly the areas where you would not find clean farmland to produce organic fruits and vegetables. This is the main reason for this disparity. The government has made a certain framework to boost organic farming and to promote the same through fairs and exhibitions, but that does not help on the ground until there is a steady and sustainable market for organic produce. However, smart transport and dedicated channels of supply are the solutions to fill this gap. Ultimately, when you start having the pull from the market, the local growers also start taking note and shift towards organic. Once the local demand is fulfilled by local supplies, the supply-demand disparity is taken care of. The Centre’s free organic certification programme “the Paramparagat Krishi Vikas Yojana” has not picked up as most States have failed to utilise the funds set aside for the scheme. A 2018 report on the implementation of PKVY highlights that all states, except Tripura, Odisha and Karnataka, have failed to utilise even 50 per cent of their funds under the scheme. While the Centre has increased allocation for the scheme by 44 per cent for the current year, corrective measures are needed to ensure that the states become responsible and contribute toward “organic India”. The challenge is convincing farmers to shift to organic, which might result in an immediate commercial impact on their income. The solution is to support the change in a gradual manner. A holistic and community-driven approach, similar to the “Swachh Bharat” for “Swachh Food” needs to be undertaken. Rahibai like farmers exemplifies not just the immense value of traditional knowledge, but also the potential of India to become a major organic producer and exporter. Trained scientists and civil engineers need to learn from such farmers and age-old water conservation practices in Rajasthan. They should tap into the ingenuity of farmers in Bagalkot district who made a dam to deal with water shortage. The future of farming lies in harvesting these energies.